load of rubbish. Sagarin rankings much worse than owgr.Jim Furyk ranked number 1. Completely discredits the whole system. Then again you probably believe Furyks better than Mcilroy. Stricker number 14. Do u want a ranking system which rewards retired players. Does 3 majors and wgcs in the states not make the rankings biased? It probably does because Im sure all ‘international’ players would play better if they could play at home every week of the year. Maybe half a stroke better. If there are 32 better players in the world better than Brooks Koepka at the minute then your system is accurate!!! Unless I am missing the point of the article, you are basing the better standard on the US tour on the scoring? That is fundamentally flawed as it is ignoring the uniform, repeptitive nature of the set up of the courses in the US, which are generally long but easy, to the variety of course layouts, locations, climates and set ups found on the european tour. There was a long time not too long ago that the world rankings were heavily slanted in the favour of the US tour as the players at the top of the rankings were from the US, they played mainly in the US thus meaning that the PGA tour events had a greater weighting for the rankings meaning the players playing those events had a greater chance of being higher up the world rankings and so the cycle continued. 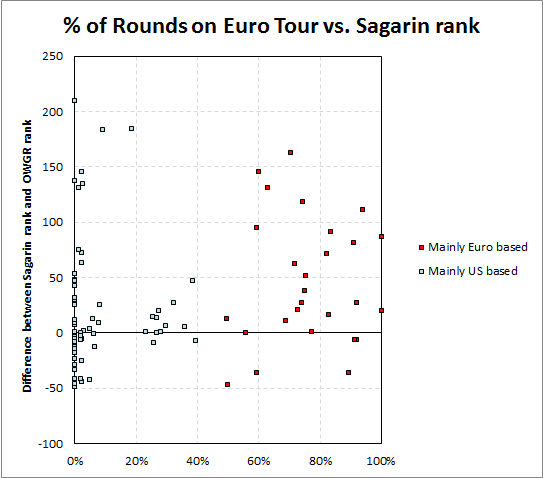 It is purely down to the improved performance of the euro tour players added to the WGC events that the world ranking tournament weightings are shifting away from the US tour. You only need to look at the trend of the ryder cup and the recent majors to see that the US players aren’t the best in the game after all. Your 1st paragraph has no absolutely basis in reality. Anyway, this absolutely isn’t about US vs. European players. It’s about US based vs. European based players. 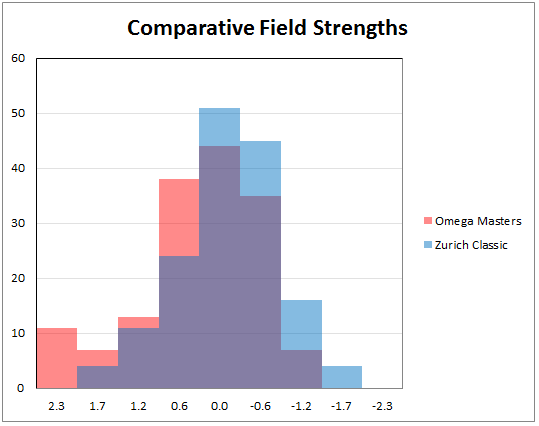 Brooks Koepka has been helped as much by the OWGR bias as Freddie Jacobson has been hurt. And it’s a consistent trend that’s been observed for over a decade now. I am well aware that it isn’t necessarily to do with europe vs US, that is the main reason I specifically said euro tour players and pga tour players. The reference to US players on the pga tour was a reference to days gone by when european tour players were limited to under 10 spots in he US based majors. My view on the courses has no basis on reality? Is it easier to putt on the same type of greens (US tour spec, if you will) cut to the same length, producing the same speed give or take an inch or 2, week in week out compared to variable putting surfaces, with varying grasses, some with grain, others without, at different speeds? I would suggest putting alone is going to be easier week in, week out. The PGA tour may go from hawaii to california, to florida to wherever but the courses are set up with similar width of fairways, similar cuts of rough with courses of similar distances. Why do you thing the bomb and gouge way of playing has become so prevelent? Except for, perhaps, this week at riveira, the masters, the open and to a lesser degree the US open, the pga tour plays the same form of golf every week. 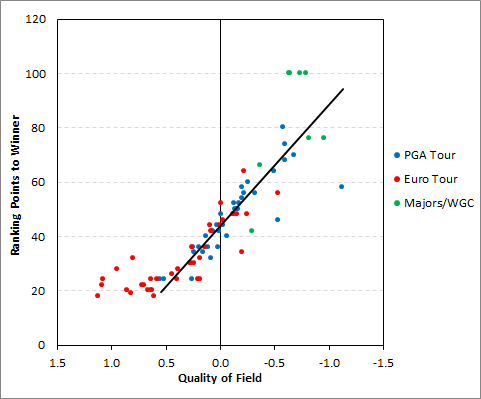 The standard may be better on the US tour but I am simply saying that, due to the nature and set up of the courses on the pga and european tours, it is a leap of faith, and somewhat naive, to base that decision on scoring alone. The problem with the European Tour is it is HEAVILY geared towards the established players. I did research on the purse sizes not too long ago. IIRC, the PGA Tour purse sizes were obviously larger (roughly $6.5 million on average to $4 million on average in Europe). 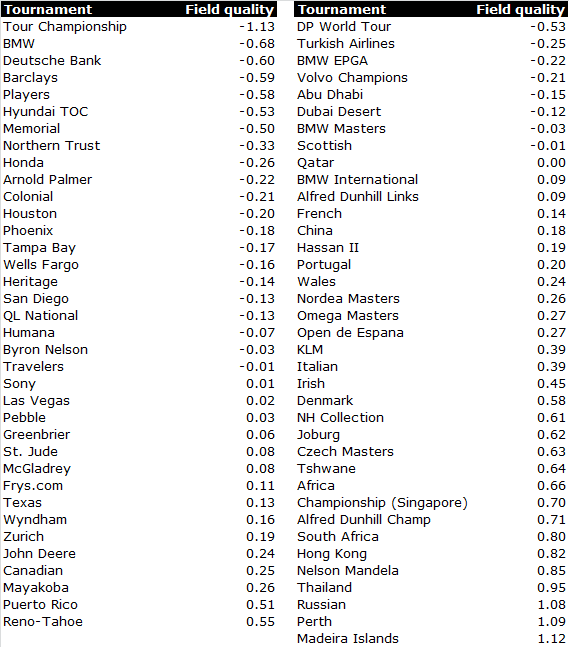 But, the variance in the size of the purse sizes was much smaller on the PGA Tour than the European Tour. 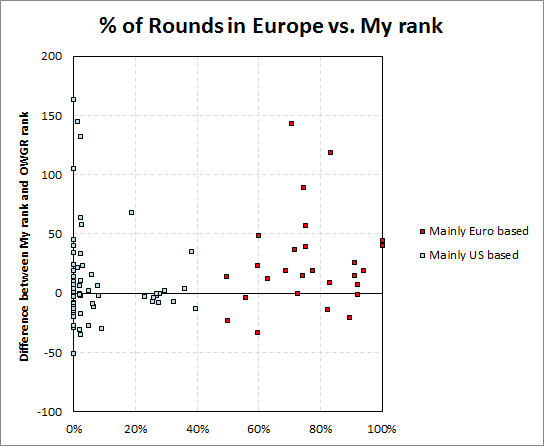 So, if a player in Europe happens to be established and gets exemptions into the bigger event, they can play worse than a lesser know Euro Tour player and make far more money. Not as likely to happen on the PGA Tour. The same happens with many international players that first come over to the PGA Tour. They play far worse than their contemporaries, but because they are allowed to play in the big purse events they can keep their card after their first year despite playing poorly. Fortunately, it only lasts for 1 year instead of a 5 or 10 years which can happen on the Euro Tour.